Regiment/Catrawd: 10th Battalion, Welsh Regiment. Military Cemetery/Memorial / Fynwent milwrol: Vieille-Chapelle New Military Cemetery, Lacouture, Pas de Calais. Ref No Grave or Memorial / Rhif cyfeirnod bedd: Plot: 1. Row: A. Grave: 2. Died of wounds on Sunday19 December 1915, aged 24 years. Wilfred Webster Tait was born in Upton, Chester, Cheshire, England in 1892. The 1901 Census shows that the family at that time lived at 31 Pepper Street, Chester, Cheshire. The head of the family was Francis Harding Tait aged 49. His wife Edith Lilla Tait aged 49 and their three children – Frank Vincent Tait aged 23, an Estate Agent, Reginald Albert Tait aged 21, a Mechanical Engineer and Wilfred Webster Tait aged 9 years. By 1911, he was living at 25 Rice Hey Road, Egremont, Chester as a Boarder and was employed as a Civil Service Clerk to the Surveyor of Farms. In 1915 he married Clara Dorothy Hulme Pickersgill and they lived at 22 West Parade, Rhyl, Flintshire, North Wales. Wilfred was a Sergeant Major in the Denbighshire Hussars Yeomanry before being commissioned as a Lieutenant in the 10th Battalion, Welsh Regiment. He landed in France with the Battalion during early December 1915 and he died of wounds some days later on Sunday 19 December 1915. Flintshire Observer Thursday 30 December 1915 – Rhyl Officers Death. Lieutenant Wilfred Webster Tait, formally in the office of the Surveyor of Taxes, Rhyl, has died from wounds received in France. Married shortly before proceeding on active service to the daughter of Mr W Pickersgill, Rhyl. He had been at the front for only three weeks. Prior to receiving his commission in the 10th (Service) Welsh Regiment, better known as the Rhondda Battalion, Lieutenant Tait was Squadron Sergeant Major in the Denbighshire Yeomanry, and previously had served in several Territorial Regiments. He was an exceedingly smart officer and had charge of the Signallers in the 1st Rhonddas. Before leaving for the front he had attended a special course for signallers at Weymouth, where he passed out at the top of the school with distinction. 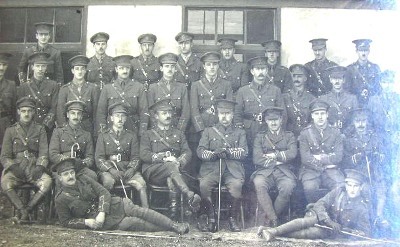 Lieutenant Wilfred Webster Tait is the Officer third from the right, back row. On 26 March 1916, a payment of £76. 0s. 3d. was made by the War Office to Clara Dorothy Hulme Tait, being monies owed to her husband Wilfred. On 1 October 1919, a further payment which is recorded as a War Gratuity of £10. 0s. 0d. was also made to her. Wilfred is also remembered on a Remembrance plaque at The Royal Alexandra Hospital, Marine Drive, Rhyl, Flintshire and on The North Wales Heroes Memorial Arch, Deiniol Road, Bangor, North Wales.